By Paula Gaelic, Manager, Western Bay Museum. The Katikati Heritage Museum was a private collection that the community had purchased in March 2011 by a newly established Trust. The Trust had no capital. The purchase saw the Trust take on a very substantial debt. For the first 18 months an Incorporated Society took care of the daily running of the museum but under control of the Trust. I joined the Katikati Heritage Museum in December 2012 from a sales and marketing background, and without any museum qualifications or experience. The museum site was located south of the township, not within walking distance of our town centre or local schools, and in a 100km speed zone. Barn constructions housed overcrowded, static displays, without consideration to preservation or conservation, and were in need of maintenance and upgrading. Whilst the collection contained some great items, no inventory existed. Nothing had been accessioned. The entrance hosted a gift and souvenir retail outlet. It was overstocked with old stock and turnover proved minimal. Adjoining the museum building was a large café. We identified the café could be a potential source of income, however location and lack of funds were an issue. 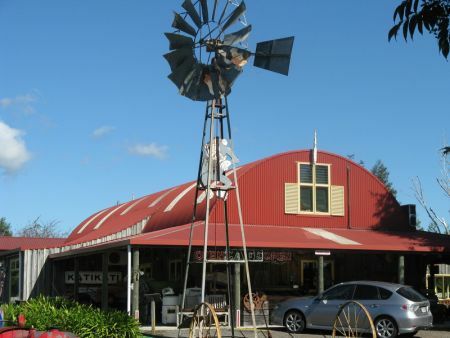 The old Katikati Heritage Museum. The original Trust was somewhat complicated and fragmented and without proactive involvement. Community input was sought. I believe partnerships, strategic alliances and affiliations are key to sustain the viability of our museum within our region. We had to engage with our community. Every opportunity to promote the museum was taken, and still is. The volunteers were happy with my appointment. They had a leader and someone to make decisions. Very quickly we became a strong team. Our local newspaper, The Katikati Advertiser, and our town’s Events and Promotions Co-ordinators, Katch Katikati, embraced the opportunity in assisting to raise our profile. Positive articles featured regularly, and we felt the community was beginning to take notice of what we were trying to achieve. The Trust Chairman resigned and a prominent and like-minded member of the community joined the Museum Trust as Chairman. We spent a huge number of hours working on the museum project but the mortgage was simply unsustainable. We applied to Western Bay of Plenty District Council to be included in the Annual Plan. We lobbied for endorsement and support. Overcoming difficulties, facing challenges, volunteer commitment, involvement and passion were truly tested when on 14 May 2014 the Katikati Heritage Museum was closed. There was no other option. To safeguard and secure the collection, West Bay of Plenty District Council purchased the collection from the Trust. The land and buildings were sold to recover the debt and fortunately the new owners allowed the Council to rent the complex. Four months later the outcome was the pack down and registration of our collection of approximately 20,000 items. Items and artefacts were numbered, photographed, wrapped, boxed and box numbered. This was all accomplished by volunteers in time for Christmas 2014. Our new Fire Station had just been constructed, leaving the old fire station in the centre of town vacant. The Katikati Community Board recommended to the council that this is where the museum should be housed. The Fire Station required earthquake strengthening and refurbishment to meet building codes. Work in progress at the old Katikati Fire Station. Image: Chris Steel/Katikati Advertiser. I am indebted to Auckland War Memorial Museum and Te Papa’s National Services Te Paerangi for their assistance and guidance. We lack museum-qualified skills, and with their continual advice and support in moving forward we are gaining credibility and knowledge. Sourcing additional funding proved impossible at this time. There was no surety so we focussed on the museum collection. We knew our rich history and collection had to be saved and on display. Our next step was an enormous rationalisation process. With our volunteers and other museums, organisations, clubs, collectors and enthusiasts we followed our rationalisation criteria. Age, provenance, rarity, condition and quality were some considerations. Items were handled for inscriptions and markings. We worked a strict programme, tracking thousands of items that are being documented. The closure was ultimately the best thing that could have happened to the collection, giving us the opportunity to do all this properly. Collection rationalisation meeting in progress. The council’s long term plan came out for public consultation in March 2015. The entire museum project relied on the outcome. There were a number of variables, including some negativity in the community. New volunteers were coming on board and some had museum qualifications and experience. 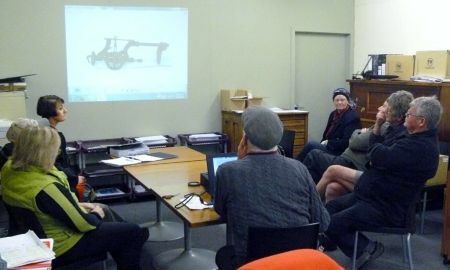 Our new Western Bay Heritage Trust was formed. Our new trustees have a very diverse skill range and understand the expectations and responsibilities of taking the Western Bay Museum to a high standard. In the future we aim to share our collection throughout the Western Bay region. The council’s long term plan outcomes were announced in June to our favour and we are delighted. 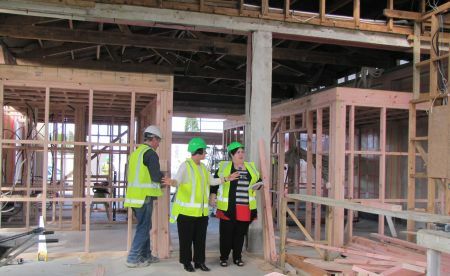 Western Bay of Plenty District Council are providing us with a rent free building in the heart of our town. We have a strong and effective partnership with our council to make the new museum a success together. A New Trust – A New Museum – A New Way – A New Identity. 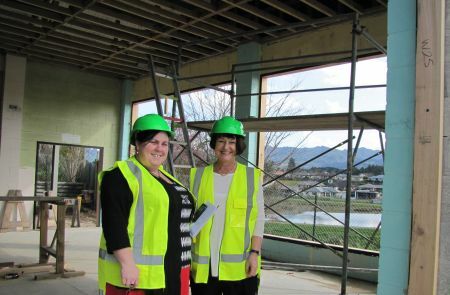 Sally August of National Services Te Paerangi (left) with Paula Gaelic at the new museum site. Image: Chris Steel/Katikati Advertiser. With ideas and assistance from Auckland War Memorial Museum we have designed a new museum, creating a balance of modern cabinetry and display throughout the Exhibitions Gallery, with a very interactive theme throughout the School Room wing. With smart planning and following the Schools Curriculum, we plan to rotate the Exhibitions Gallery at the end of each school term. We want the onsite, offsite and online audience experience to reflect a museum full of life and vibrancy – a must do destination that evokes the desire to revisit. A new logo, website and social media designs are underway. Our current position is to raise the other half of our fit out costs, which, having the commitment and partnership of council, are within our reach. Success will depend on the capacity of the Western Bay Museum to deliver on its vision and on the courage and belief of our supporters. Community partnerships, a solid base and a commitment to deliver will enable the Western Bay Museum to forge a long and sustainable future. Western Bay Museum plans to be open this side of Christmas. Onsite – Offsite – Online. Sharing our collections and exhibitions within our region and to the world! 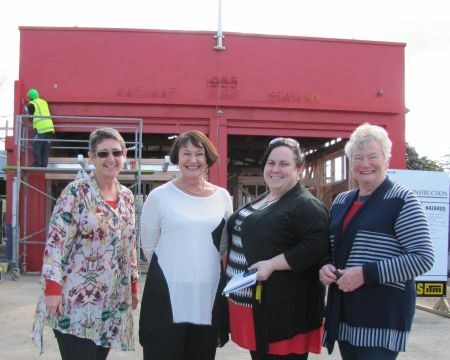 Diane Stevens, Paula Gaelic, Sally August and Nolene De Luca outside the new look Western Bay Museum. Image: Chris Steel/Katikati Advertiser.